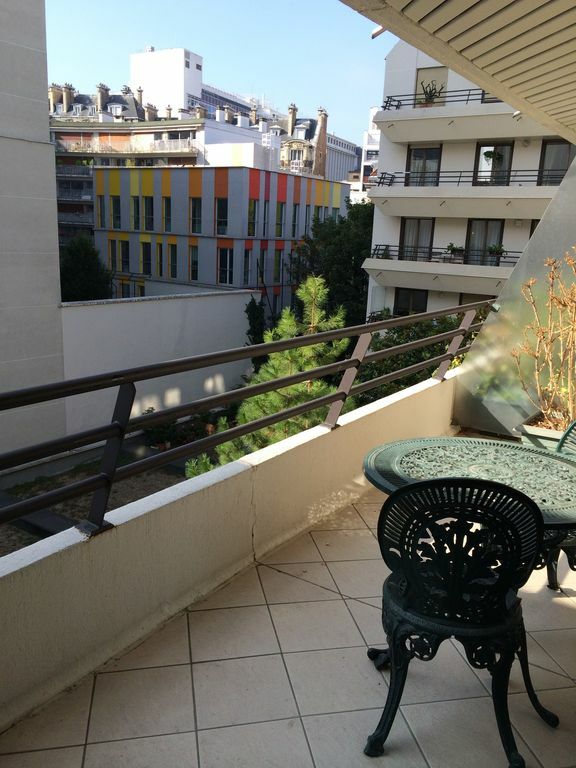 - Rue Antoine Bourdelle, in the 15th arrondissement, at the border of 6th and 7th arrondissement, central location in Paris, 2 minutes walk from metro Montparnasse and many bus lines. Many shops, restaurants and cinemas. - Very quiet (overlooking a garden) and full of light (south oriented). In a few days we leave after almost a 2 month stay. The apartment is great and the amenities are fabulous. Nearby is a major Metro station, a major train station for trains to the south (we went to Chartres), bars, restaurants, supermarkets, clothing stores, dry cleaners, pharmacies. All the comforts of home within walking distance. Pascal, the owner, is wonderful. The only misleading item in the description is that the housekeeper is not included during your stay, just at the end when you leave. Thank goodness Pascal includes a vacuum cleaner in the apartment. The building concierge was a great help as she received some packages we had shipped here. And above all, the bed was very comfortable. We'd stay here again if we returned to Paris. Feel like you live in Paris. The apartment exceed our most optimistic expectations.Perfectly clean, good size with nice separate kitchen. Queen bed is very comfortable, better than ours at home. The Montparnasse area has every imaginable shopping opportunity. A museum is across the street. Wednesday, Saturday street market is handy. Metro is quite close. We will stay here again. You should too! "This is a wonderful apartment in a quiet street . No views from the apartment but a very striking museum of sculpture immediately as one comes out the front door of the apartment building. It is handy for everything, tastefully furnished and very well equipped. The owner is helpful and nothing was too much trouble either for him or his cleaning lady. We spend one month in Paris each year and this is one of the best apartments we have ever rented." Appartement très propre, très bien entretenu, bien équipé, et super sympa! Appartement très propre, très bien entretenu, bien équipé, et super sympa! Tout ce qu'il faut pour un excellent séjour à Paris! "Appartement parfaitement tenu, très bonnes prestations."